Lenzyme’s Trap Cleer is a professional grade preparation of enzymes and bacteria specifically developed to handle drain problems and spills. It can be used for all kinds of things, from clean up in automotive garages to taking care of sewage spills or clearing up problems in septic pits or tanks. It is available in professional grade volumes, but can also be packaged for private use. Superior Septic Services offers Trap Cleer as part of our septic tank/home septic system management products. There are many products out there that claim to be useful for your septic tank, but the real truth is that most of them are not. Some can even harm the biological stew that makes your septic tank work efficiently. If it is sufficiently damaged, about the only thing a homeowner can do is to have the tank pumped and begin over. Lenzyme’s Trap Cleer is non-corrosive, non-poisonous, non-toxic and non-caustic. Even so, it should be handled carefully, using manufacturer directions preferably by a licensed septic worker. However, we offer it along with other genuine septic repair supplies through our online store for your convenience. 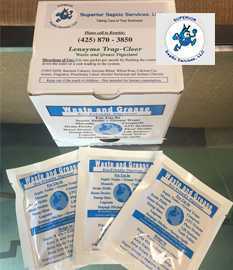 Here at Superior Septic Services, we have Lenzyme’s Trap Cleer for sale because we believe that providing professional grade parts and supplies will help both licensed septic repair people and DIY homeowners to maintain home septic systems appropriately. We not only offer Trap Cleer, we also have Blitaroot, for removing the roots from your drain, risers, riser lids, and riser screws. You can purchase these parts by accessing our online store or by calling (425) 905-2485 to learn more about our many services. We are dedicated to helping you keep your home sanitation system running in a quiet, unobtrusive and ecologically safe and efficient kind of way. These products are just one small part of the service we offer our community.